This morning I attended my son’s band concert at his school and wore this new dress from the IGIGI ‘Golden Age of Couture’ collection. I previewed some of the collection last month in a post and this dress that I wore today was one of my faves from the line. It is called the Margarita Plus Size Gown in Crimson ($250, Sizes 12-32). I chose this gown for one because of the on-trend cold shoulder design and the side-slit with ruffle detailing. You can really get your Angelie Jolie Famous Leg Pose on in this one. This wrinkle-free jersey gown is another one of my holiday recommendations and is perfect for either a formal event, a night of dancing or for attending a jazz concert like I did today. I wanted to be sure he saw me in the crowd and with this beautiful hue of red he was sure to spot me. (Hey, I’m trynna get (Christmas) Mother of the Year here, lol). 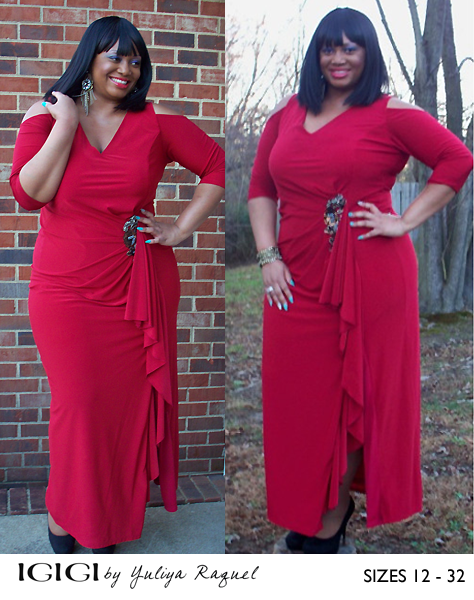 But regardless of the color, you will always be a standout in every IGIGI item anyway. The plunging V-neck shows just the right amount of the décolleté, the side seam slit is decorated with the waterfall flounce and it even has a jewelry-like detail in its hand-beaded embellishment. You won’t need many accessories in addition to the side embellishment and therefore I only wore dangled earrings and a sparkly bracelet. Since it was a bit nippy outside this morning I wore a pair of Hanes Silk Reflections Pantyhose (3-pack, $21.49 from Just My Size) in Barely There. I usually don’t wear much hosiery but when I do I turn to these and have been wearing the flesh-tone hose since my high-school years. They are my go to pantyhose for that ‘natural leg look’ effect. I wore just plain black pumps from Charlotte Russe when I realized that I don’t own any goldish tone shoes but I would recommend a pair like these to really compliment the accent on the dress. If you’re interested in purchasing this gown, below are some promotions from IGIGI by Yuliya Raquel…. 3. Free Shipping and Returns On all Continental U.S. orders placed through December 30, 2012. No code necessary. Visit www.igigi.com for more details. Also check out the Holiday Calendar,http://www.igigi.com/cms/glamguide#180 for 12 days of fabulous fashion features and promotions. Beautiful dress!! I love the embellishment on the side. You are stunnning!! !